City of Ann Arbor systems planner Wendy Rampson responds to a question from Ed Walsh, a citizen who attended Monday's A2D2 briefing in city council chambers. Slides for the briefing and a video replay of the first briefing are available online. The Chronicle attended a noon briefing on Monday in council chambers, where more than a dozen other people showed up, including: Carsten Hohnke, a Ward 5 representative to city council; Bob Needham, opinion editor of The Ann Arbor News; Steve Bean, chair of the city’s environmental commission; and Ray Detter, chair of the Downtown Area Citizens Advisory Council. Developer Peter Allen briefly poked his head in the door. Rampson began with a historical overview of downtown development dating from 1963, when there was support for building high-rise development, followed by a negative reaction to the high-rises that were built, which resulted in a study commissioned from the firm JJR (then a relatively new company). Two principles from that study, which still play a key role in planning for downtown Ann Arbor, are (i) the use of floor area ratio (FAR) to manage density – as opposed to height limits, and (ii) exemption of downtown development from parking requirements. D1 and D2 areas. D1 is darker. This image is linked to the full resolution .pdf file. D1 covers core downtown, while D2 is conceived as a transition area from the core to the purely residential neighborhoods. The majority of the D2 area is located to the west of downtown in the Allen Creek floodplain along First Street. 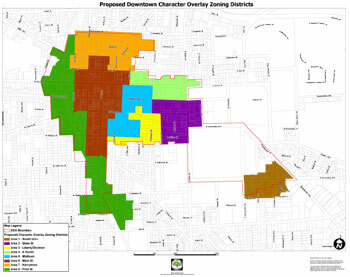 First Street is also a label given to one of eight character districts, which are overlayed on top of the D1 and D2 zoning districts. Those districts are: South University, State Street, Liberty/Division, East Huron, Midtown, Main Street, Kerrytown, and First Street. Rampson acknowledged that there was some dissatisfaction among various constituencies with the fact that the South University area had not been buffered with a D2 area, but said that the small size of the South University area precluded incorporation of a transition zone in addition to a core zone. Not expressed explicitly at the briefing on Monday, but voiced occasionally through the A2D2 process by members of the public, is the idea that if only one zoning designation is possible in the South University area, then that designation should be D2 as opposed to D1. Though it is proposed to be D1, South University does have something in common with D2 areas that is not a general feature of D1 zones: the inclusion of a height limit (120 feet). That height limit is greater than the 60-foot limit proposed for D2. Density of development is the key distinction between D1 and D2. Some of the comments and discussion at Monday’s briefing centered on the nature of the FAR computation. The FAR is calculated as the ratio of (total floor area of the building) to (area of the lot). Ray Detter asked Rampson to clarify whether the total floor area was meant to include elevator shafts, citing the Metro 202 project as an example where elevator shafts had not been included. Rampson said that the intent was to craft language for the new zoning that would make clear that it’s wall-to-wall gross floor area (i.e., elevator shafts included) that’s at issue. Proposed character districts. This image is linked to the full resolution .pdf file. A member of the audience at Monday’s briefing pointed out that many people might erroneously apply a rule of thumb something like “N% FAR means an N-story building.” Rampson confirmed that this was an erroneous interpretation and said that this was one of the challenges she was trying to meet during her briefings. 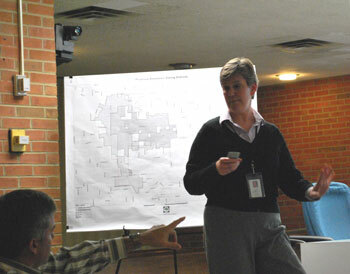 She pointed to an example on one of the slides designed to illustrate an accurate interpretation, which shows a one-story building constructed with a footprint exactly half of the lot: 50% FAR. In that example, h is 40 stories. That is to say, Chronicle Towers could be built to a height of 40 stories if we built it with a 1,000 sq.ft. footprint on a lot that is 10,000 sq.ft. in area. What will stop us from building the project? Nothing but the doomed economics of a building with that small a footprint built to that height. Rampson fielded questions and concerns from the audience throughout her presentation as well as at the conclusion. Ray Detter expressed his concern that the design guidelines that are intended to work in concert with the new zoning regulations were being placed “on hold” and not passed as a complete package with the zoning rules. The fact that the historic district guidelines were also being placed on hold added to Detter’s concern – as well as his feeling that one of the three A2D2 steering committee members would prefer to scrap the design guidelines altogether (as yet not clear to The Chronicle which of Pratt, Higgins and Hewitt was intended). Detter stressed that the whole package, including design guidelines, should be passed so that consistency could be achieved, which had been lacking in the past. Among the proposed zoning concepts for massing of structures that Rampson presented is the notion of streetwall, and the goal of the massing requirements is to mitigate against an unpleasant pedestrian experience for people walking past tall structures by controlling the streetwall. For example, the idea is that a pedestrian could have the feel of walking next to a 4-story building when it was in fact much taller. One audience member asked that consideration be given to the experience of people who live in the vicinity of the taller buildings and not just those who are walking past them. Although the D1 and D2 areas coincide very closely with DDA boundaries, there are areas where non-DDA areas are included, for example in the Washtenaw Dairy block and Fingerle Lumber property. Rampson stressed that even in those areas that fell outside the DDA boundaries, the current zoning includes commercial and that the proposed new zoning does not affect any areas currently zoned residential. Noting that the DDA boundaries had been set up in order to capture taxes, not necessarily as a planning boundary, Carsten Hohnke asked Rampson if planning staff also found the boundaries useful for planning, and asked if through their process they had followed the example of the Downtown Residential Task Force, which considered an area that extended 1/4 mile beyond the DDA boundary in its previous work. Rampson said that the DDA boundaries were very useful in planning, and that in this planning effort they had not extended the scope of consideration to the 1/4 mile mark. Much of the conversation – which also evolved among audience members both during and after the briefing – centered on the difficulty in projecting the future market for property downtown. One woman in the audience asked why there was the expectation that there was a potential residential market for recent graduates and empty-nesters downtown. Another gentleman asked why there was a preference for residential units (reflected in FAR bonuses for building them), when the construction of a first-class headquarters building for a major company could reap benefits for downtown and the community as well. The idea of FAR bonuses for offering particular kinds of retail (for example, grocery) was also briefly explored. Rampson said that the strategy was to encourage more residential density and from that might follow the possibility that grocery retailers would recognize the potential market. In response to this, someone suggested it might be more effective to provide efficient transit for getting people to the large full-service grocery stores on the periphery. Another concern brought up was the possibility that as students are “drained” from the student neighborhoods to student-centered housing developments downtown, a local economy based on landlord-ship could completely change. With respect to student-centered development, Rampson acknowledged the relative lack of flexibility for changing markets in a building with 6-bedroom units as compared to one with 2-bedroom units, but said that unit size was not envisioned as a part of the revised zoning code. Rampson took copious notes on audience questions, but also urged audience members to convey their concerns in writing by Dec 1. directly to A2D2Feedback@a2gov.org. 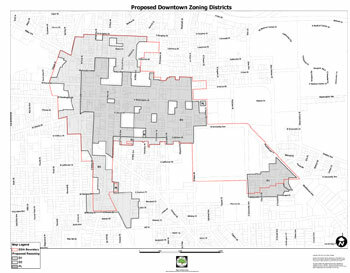 Along with the two basic zoning districts and the eight character districts, the proposed revisions to downtown zoning necessarily include a specification of possible land uses inside the districts. When The Chronicle followed up with Rampson by phone after the briefing, she addressed the concern expressed by some citizens that adult entertainment is an allowable use throughout D1. Rampson said that Michigan case law seemed to indicate that some geographic opportunity must exist for categories of use, including adult entertainment. And she is working with Kevin McDonald of the city attorney’s office to determine whether the collection of M1, M1A, and M2 parcels in the city (currently zoned for adult entertainment) together constitute enough area to meet the case law standard for an geographic opportunity. She held open the possibility that adult entertainment could be eliminated from D1 as a possible land use. The other land use in the proposed new zoning that has generated some discussion community-wide is a convention center as an allowable use. Use as a convention center is proposed to require a special exception, which would come from planning commission. City council would still need to approve the whole project.